In the Spring of 2013, the Solar Industry's most respected technical training program, Solar Energy International, comes to Colorado's Front Range. For over 20 years, Solar Energy International (SEI), the renewable energy industry's gold standard for professional technical solar training and curriculum development for a clean energy workforce, has been quietly turning out thousands of alumni and graduates right in the backyard of Colorado in the small mountain towns of Carbondale and Paonia. On April 22nd, SEI will be offering a week long training, PV101: Solar Electric Design and Installation (Grid-Direct) in Boulder, Colorado. This course will provide an overview of the three basic PV system applications, primarily focusing on grid-direct systems. The goal of the course is to create a fundamental understanding of the core concepts necessary to work with all PV systems, including: system components, site analysis, PV module criteria, mounting solutions, safety, and commissioning. The course will also cover the basics of sizing a residential grid-direct system, wire sizing, overcurrent protection, and grounding – all of which will be expanded upon in other courses as students work towards graduating from SEI in the Solar Professionals Certificate Program. Located on the Western Slope of Colorado with campuses in Paonia and Carbondale, SEI has trained more North American Board of Certified Energy Practitioners (NABCEP) Certified PV Installers and leaders in the solar industry than any other training organization, trade school, or community college in the United States. In addition to offering training in the Western Colorado region, SEI offers training in many "solar friendly" and up and coming regions of the U.S. that are actively adopting renewable energy resources. Chris Turek, Director of Online and Student Services for SEI said, "Every Spring we start offering in-person classroom based courses that are the prerequisite training to come to a week long hands-on lab opportunities that start in the late Spring and run through the Fall out here in Paonia. We make our way down from the mountains to the front range every year and introduce Denver, Boulder, and other front range residents to what we have to offer here on the Western Slope. Many of our students decide to continue on with their education and attend a lab week in the summer in Paonia. An increasing amount of our students choose to continue on to graduate from SEI by taking a series of courses. This past year we launched technical solar training certificate program where students have to complete at least 160 hours of training to graduate with a technical certificate from SEI. This program is called the SEI Solar Professionals Certificate Program. The credentials earned from this certificate training prepares them for Certifications like NABCEP and other industry leading certifications." In addition to serving Colorado, SEI has trained over 25,000 students from all over the world that have come through their technical training programs over two decades of service to the renewable energy sector. 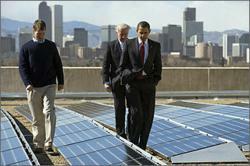 Many of them are now the small business owners and leaders in the solar industry. Turek went on to point out, "When President Obama chose to visit Blake Jones and Namaste Solar a few years ago at their Boulder based Solar PV Installation company to sign important legislation that would help with clean energy training and jobs, SEI was proud to be there in spirit. "Blake is one of our prominent Alumni and was able to take center stage at that signing. We have hundreds of success stories like Blake that have either started their own business, gone on to be leaders at larger solar installation firms, or have taken their knowledge to developing countries of the world to make a difference. We are excited to offer another training in the Boulder, CO. area as that region of our country continues to be a bright spot for renewable energy."